85 percent of the jobs that will exist in 2030 haven’t even been invented yet. Jaw-dropping, right? We think so. That’s why Canada Learning Code is working hard to make sure Canadian young people have access to the technical education they need early on, to help them find their place in our rapidly changing employment landscape. And we’re not alone – Amazon announced this week that they’re joining us in championing digital literacy for our nation’s young people by making a three year, $525,000 donation to Canada Learning Code. Their investment will go toward supporting the development of a Canadian first kindergarten-to-grade 12 computer science education framework, as well as bringing hands-on coding learning opportunities to 275,000 young learners across the country. 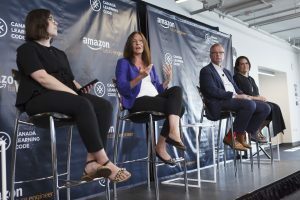 To celebrate our partnership, we hosted a panel discussion on the Future of Work at Amazon’s Vancouver office earlier this week. Moderated by CLC’s own Melissa Sariffodeen, we discussed how technology is changing the employment landscape and why accessible tech education was important for Canadian youth with Amazon’s Senior Vice President of Worldwide Human Resources, Beth Galetti; BC Minister of Jobs, Trade & Technology, Hon. Bruce Ralston; and CEO of the Boys and Girls Clubs of South Coast BC, Carolyn Tuckwell. Check out a recording of our conversation here. While our panelists discussed the numerous ways technology has and will continue to shape how Canadians work, 25 young campers from a local Boys and Girls Club were busy creating next door, learning the fundamentals of coding by building their very own video games. Far from the quiet concentration most of us associate with programming, our young learners were working together, laughing and arguing about their next steps and proudly raising their hands to answer our instructor’s questions throughout the lesson. Watching them work, it became clear: these are the kids who will be at the forefront of Canadian innovation in the coming decades. Investments like Amazon’s are making sure that hundreds of thousands of young people will have the opportunity to unlock the power of code in reaching their personal and professional potential. We can’t thank them enough for the future they are helping to make possible.